The shadow of Karl Barth looms over us all whether we know it or not. His neo-orthodoxy not only made a tremendous impact on 20th century theology in itself, the theological method of his system provided the basis for subsequent radicals such as the “death of God” theologians who claimed to just be taking Barthianism to its logical ends. Partly due to the enthusiasm of some Princeton theologians, Barthianism is now in a period of renaissance. Barth is “in,” and his thinking blends well with postmodern theology which denies the existence of absolute, objective truth. When liberal theology reached its lifeless, meaningless destination in the 20th century, many theologians leaped from that sinking ship into the waiting lifeboat of neo-orthodoxy (supposedly a “new” orthodoxy). The man piloting the life boat was Karl Barth, a theologian who did not dispute classic liberalism’s contention that Christianity was not literally true. He merely added a new thought to the mix. To Barth, Christianity was existentially “true.” Barth’s existential truth was absolutely and irrevocably separated from the literal. Barth’s gospel is very meaningful and inspirational – just not real in the “crude” sense of things that happen in time and space. Barth had “rescued” Christian theology from the attacks of the liberals at the expense of its actuality. Barth was extremely passionate about his theology, and spoke of it with superlatives and impassioned rhetoric. It clearly came from his heart. It was existentially and subjectively meaningful to him but it was not objectively and historically true. Barth’s gospel is a life-changing one in the same sense Hemmingway’s The Old Man and the Sea was meaningful to me – in its subjective impact as a work of fiction. The neo-orthodox gospel may not really save but it does make us feel “saved,” and for an existentialist such as Barth, that is all that really matters. I hear the Barthians’ response already in my mind, “A Van Tilian caricature!” Cornelius Van Til was just the most notable of early Evangelicals to assert the same things I just have about Barth’s “neo-orthodoxy.” Other Evangelicals who spoke the same way about neo-orthodoxy included John Warwick Montgomery, Harold O. J. Brown, Carl Henry (though not at the very beginning), Charles Ryrie (who wrote the briefest and easiest to understand critique of neo-orthodoxy), Gordon Clark, and Francis Schaeffer. Van Til’s analysis was the most involved and it extended through the writing of several books on the subject. 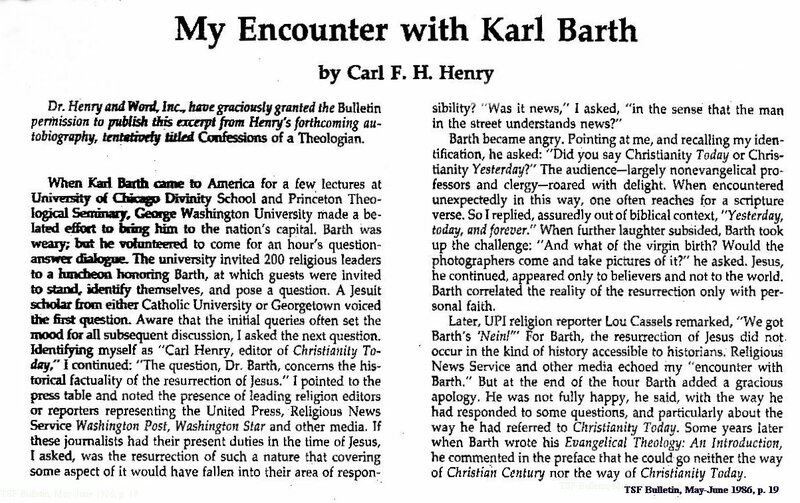 Barth’s response was to dismiss his analysis with the label “caricature” – a term Barthians have invoked ever since. They inevitably try to bolster this “caricature” defense with quotations from Barth that sound quite orthodox and even pious. Anything Karl Barth or any neo-orthodox theologian says must be understood in the larger context of their whole system of thought, however. The entire system creates a kind of theological method that transforms the meaning of everything the neo-orthodox say — making it possible to produce almost countless quotations from Barth that passionately affirm the same words Evangelicals speak. Make no mistake, though, Barth by no means meant the same thing Evangelicals do even though he used our terminology. Everything Karl Barth said or wrote about Christian theology must be understood to exist in the mysterious world of the “Neo-Orthodox Triangle” – the intellectual equivalent of the Bermuda Triangle. Ordinary laws of thinking do not apply in the Neo-Orthodox Triangle. Cardinal truths fly into the triangle and are never seen again. Biblical, Christian faith becomes mysteriously shipwrecked in the triangle. The three sides of the triangle are Barth’s views on God, revelation, and history. Everything else that Barth says about theology must be understood to exist within the closed system of these three concepts. First, Barth’s God is “wholly other.” This phrase sounds on the surface like a claim to God’s exceeding greatness but that is not what Barth had in mind. Barth meant that there is nothing in God which in any way corresponds to anything in humanity. Thus, for Barth, there is nothing about God that we can really understand, for to understand God is a form of cognitive idolatry in which we attempt to capture and enslave God, reducing Him to our finiteness. This pious sounding argument denies Scripture’s teaching that humanity is created in God’s image (Gen 1:26-27, Jas 3:9). Though we certainly cannot know everything about God exhaustively, there are things about God we can know because He has created us with the capacity to do so. As Roger Olson has conceded, the Barthian God is a Gnostic concept. He can have no immediate dealings with us and there is no possibility of communication between God and us. This is the first side of the triangle. God and creation can never meet. Christ is not a person in the sense that we can posit personal attributes of Him. What then are we to make of Scripture? Scripture is not revelation according to Barth. It is only a human witness to revelation which cannot be spoken of or described. So “Christ” is the revelation but that revelation can never enter creation. It touches us “as a tangent touches a circle – that is without truly touching it.” Good luck figuring that one out. But that is, of course, the Barthian point – Christianity is not something we can in any way or to any extent figure out (that would be idolatry). This non-revelatory “revelation” is the second side of the triangle. Now, if God is so wholly other that He cannot enter our world except as a tangent touches a circle – without really touching it — what are we to make of the biblical claims to such things as the incarnation, the cross, and the resurrection? They happened in real history, says Barth, just not in the time/space continuum. Theology has a special kind of history called geschichte, which must never be confused with the mundane, real world history or historie. Jesus died on the cross and rose from the dead for our salvation. He did so in real history and we are really saved as a result. Hallelujah! We just have to be careful to never assert that any of this happened in the non-theological, real world. This “Christ event” is the most important thing of all! The glorious Christ event in which a real savior really died for my sins is the most significant thing in life! Shout it from the rooftops, but just don’t confuse it with the really, really, real. This astounding view of history is the third side of the triangle. Barthianism gives us many warm fuzzies but it delivers a God who cannot be spoken of who does not reveal communicable truth and who “acts” within a nebulous, ethereal realm that is quite wonderful but lacks the quality of being real. Yes, Barth rescued theology from the liberals but only by making it into a grand scheme of nothing but feeling. Within the triangle, Barth boldly proclaims the gospel with all of his heart. Within the triangle, Barth adores Christ and effuses about the Word (not to be confused with Scripture). But everything in the triangle exists in a theological, never-never land. It is significant and “meaningful” (in the non-cognitive sense) make-believe and nothing more. 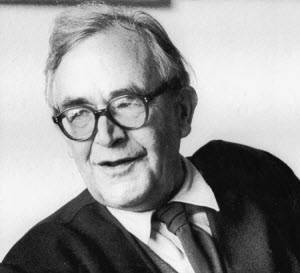 Barth contradicts himself an almost countless number of times in his writings – a conscious device of his known as “dialectic.” He would neither affirm nor deny, for example, the charge that he taught universalism (which he did teach — but what difference does it make in his triangle?). For Barth, theology cannot be reduced to the categories of true or false – theology exists within the realm between the two in which nonsense is considered good teaching. As a dialectical theologian he was able to speak out of either side of the mouth, depending on the need of the moment. Barth told Carl Henry that the life of Jesus (including the cross) was not observable by natural eyes, yet he told Lewis Smedes that the tomb was empty following Jesus’ resurrection. Both were true to Barth, for Jesus never entered the real world of historie, but he most gloriously rose from the dead in the fictional world of geschichte. It is not just early Evangelicals that cried foul when they discovered the Barthian method or system. Religious Liberals Reply, a book written by some of Barth’s liberal contemporaries, complains that Barth’s theology is incoherent and inconsistent – a complaint that can be written off, of course, as a “caricature.” Sophisticated theologians “understand.” In addition to liberal theologians, some inclusive, religious pluralists such as Ninian Smart are agreeing with the “Van Tilian” interpretation, claiming Barth as one of their own. They see Barthian neo-orthodoxy as freeing Christianity from the bounds of doctrine, enabling it to morph into any religious expression one finds in the world. If one wishes to make Barth momentarily Evangelical to fend off Evangelical critique it is most easy to do so! Just pluck some quotes out of the triangle and offer them as though they meant something in the real world. Mix the quotes with a large scoop of jargon and obfuscate vigorously. Voilà! You have just cooked up the “caricature” defense. You are now in a position to attach to opponents the most demeaning labels you can think of. Anti-Barthians become the outcasts of the theological world in this era of Barthian correctness. Credit: The image of Karl Barth was obtained at Wikimedia Commons, and is licensed under the Creative Commons Attribution-Share Alike 3.0 Unported license. The paragraph that begins “Anything Karl Barth or any neo-orthodox theologian says…” is a non-falsifiable accusation. I could just as well say of you that “Anything David Kowalski says cannot be trusted, because he really means something different and sinister even though he uses Christian language.” This kind of talk only conveys distrust and suspicion of another man for whom Christ died. Answer the man’s claims directly, don’t sow seeds of distrust without understanding what you are “plain talking” about. Paul: I knew the post on Barth might get some lively responses. First, I consider the post more of an editorial than an article. For a fuller response to Barth one should consult the writings of one of the early Evangelicals that I spoke of. It seems I did not make myself sufficiently clear in the paragraph you cite, because your comparison of what you might say of me has no similarity to what I said of Barth. You said “I could just as well say of you that ‘Anything David Kowalski says cannot be trusted, because he really means something different and sinister even though he uses Christian language. '” Of course, I do not think you have sufficient evidence to make such a statement. However, if I had millions of words in print which showed that I created a closed system of thought that made any assertions within the system something less than factual or orthodox, you would be quite justified is saying something like, “Anything David Kowalski says must be understood within the larger context of his systematic theology which portrays everything in theology as less than real, factual, or orthodox.” I never said that what Barth says cannot trusted in the strictest sense — just that his sayings should be understood in the full context of his system of thought. When someone’s thought is as systematized as Karl Barth’s, a responsible reader will try to understand individual statements within the overall context of his system. This is all I asserted, and I maintain this is the only, responsible and scholarly thing to do when one is trying to understand the intent of someone like Barth. By the way, I agree that Christ died for Barth and many other people I disagree with on certain points. You give no reason for rejecting the conservative, Evangelical analysis of Barth other than that it appears to seem uncharitable in your eyes for us to “test all things.” Nevertheless, I respect your right to disagree with me, my brother. Thanks for your helpfulness, Mark. I have changed the link in the article accordingly.